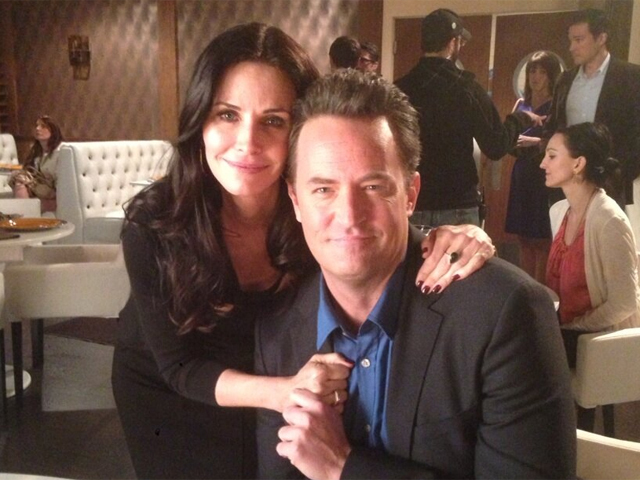 Monica and Chandler are reunited. Former "Friends" co-stars Matthew Perry and Courteney Cox are set to appear together on Perry's sitcom, "Go On," in April, and Cox is offering up a sneak peak. In the upcoming episode, Cox will play a potential romantic interest for Perry's character. It's been nine years since "Friends" wrapped its final season after a 10-year run. The "Go On" stint marks their first on-screen reunion. In the NBC series, Perry portrays Ryan King, a sports talk radio host who is eager to get back to work after the death of his wife. "Go On," which is in its second season, airs Tuesday nights at 9 p.m. ET. Tell us: Would you want to see a "Friends" reunion?